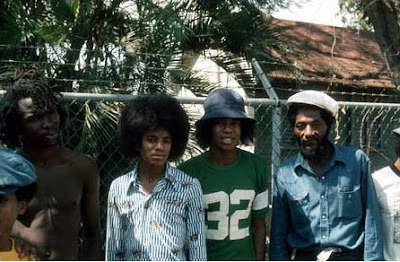 Bob Marley Meets The Jackson 5 In Jamaica in 1975! 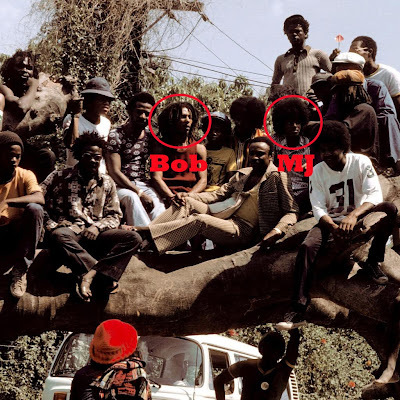 I recently came across some amazing historical photos of Bob Marley and member of The Wailers meeting Michael Jackson and The Jackson 5 at Marley’s house in Jamaica in March of 1975. It was a momentous time for both as the Jackson 5 had officially left Motown, the record label responsible for turning the group into the first black teen idols, appealing to both black and white audiences. It was also the year Bob Marley had his international breakthrough with "No Woman No Cry" from the Natty Dread album. At the invitation of opposition leader Edward Seaga (who was previously a music promoter in Jamaica before entering politics), The Jackson 5 and their entourage traveled to the island to to open for Marley and his band at the National Heroes Stadium. Before the concert, the band visited Marley at his home at 56 Hope St. in Kingston. A number of pictures of the meeting were taken to mark the historic occasion including the picture at the top of the post. Here’s Bunny Wailer with Michael and Jackie Jackson. Finally, below are a few more Jackson 5/reggae related musical connections. The first is video from a Jackson 5 television special from 1977 featuring a medley of songs including The Wailer's iconic "I Shot The Sheriff." Here is a personal favorite of mine. Its a reggae version of Michael Jackson's chart topping "Shake Your Body" that was recorded by Little Carlos in 1981. The singer is such a MJ sound alike that for a time I was convinced that the King Of Pop had recorded a reggae version of his own song! Enjoy! The Stones Go Ska! -- Phoenix City All-Stars Ready To Release "Skatisfaction"
Phoenix City All-Stars forthcoming album "Skatisfaction" is a Studio One meets Skatalites-style take on the Rolling Stones, including versions of "Satisfaction" featuring Trojan Records legend Freddie Notes, "Under My Thumb," "Play With Fire," "Paint It Black" and "Love In Vain." The band features members of Pama International, Sidewalk Doctors, Intensifed, Dub Vendor All-stars, The Delegators, Big Boss Man/Bongolian, The Loafers, and Kasabian. "Skatisfaction" follows hot on the heels of "Two Tone Gone Ska," released by the band last fall, which is a collection of mostly instrumental versions of classic 2 Tone tracks including "One Step Beyond", "Stereotype", "Tears of a Clown" and "The Prince," "The Selecter," "I Can't Stand Up For Falling Down," "Ghost Town," and "Too Much Too Young dub." If you'd like to preorder a limited edition vinyl copy of the album (only 300 copies have been made and their are under 90 left) do so quickly at www.londoninternationalskafestival.co.uk/shop. It looks like they're going to sell out before the official release in Sepetember! It's also available to preorder on CD now. 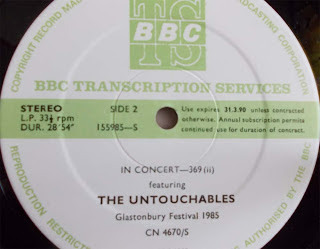 Thanks to my ska blogging comrade Tone & Wave, I just came across a rare BBC recording of The Untouchables live at the 1985 Glastonbury Festival.These BBC transcription discs are high-quality live-recordings which were intended for radio broadcast only and were made in a very limited quantity normally not exceeding 100 copies. The Untouchables 'Wild Child' album was released 28 years ago during the spring of 1985. It remains one of the earliest and most popular examples of purely American-styled ska mixing in soul, pop and funk. The success of The Untouchables and their giant step from local Los Angeles ska/mod heroes to a major label deal with Stiff Records in the U.K. is a classic story about how old fashioned DIY marketing, self-promotion and good luck used to work in the music business (now all you need is a YouTube video!). 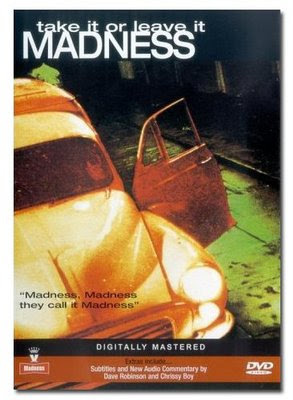 Josh "Acetone" Harris joined the band in 1983 right before they signed to Stiff Records. He was originally hired to engineer sessions for the band's two indie singles "The General" and"Tropical Bird." The session producer suggested to the band that Harris add an organ part. Since the band lacked a keyboard player, they approved. The only organ available was an old Acetone, which is much smaller than a Farfisa (hence Harris' nickname). Later, Harris was brought in as a replacement for one of the original members, guitarist, Terry Ellsworth. Eventually other members were replaced and the band evolved into the group that recorded 'Wild Child'. "We once flew into the U.K. to play Glastonbury Festival (early summer of 85?). We left 95 degree Los Angeles to arrive in 50ish degree London and we were forwarded off to the venue. As we were a fun and merry bunch and loved a little laugh, we decided to perform wearing our California surfer finest to this rainy outdoor event. There we were in sunglasses, shorts, tropical shirts, keds. Upon arrival on stage, the moshers down front became a bit overcome with emotion. They began to pummell us with mud. Maybe they didn't appreciate our sense of humor, maybe they did, I don't know. After the set, we preceeded off to our dressing room, which was one of several backstage trailers. Narrow wood planks led through the mud, from the stage to the trailers. I had heard from quite a few Brits that I had a striking resemblance to Mick Talbot, a keyboard player (like myself) who played with Style Council. They happened to share the bill with us. Now who do I see walking up the plank right toward me, but old Mick himself. Just like Robin Hood and Little John (Mick was Little John, of course)facing off. Well he did look an awfully lot like me, but I was definitely better looking, no question. I was tempted to nudge him off the plank as we carefully passed, but ever the gentleman..."
1. (I Spy For The) F.B.I. Thirty years on since "Pass The Dutchie" stormed charts around the world, Musical Youth are working on a new album. 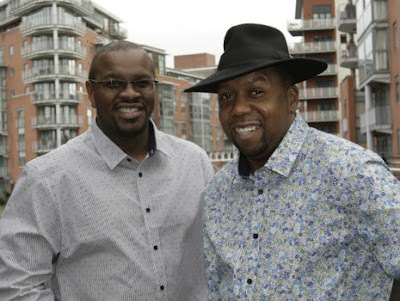 The Birmingham-based band – featuring original members Michael Grant and vocalist Dennis Seaton – plan to celebrate the milestone with the release of a series of EP's titled "When Reggae Was King," featuring a collection of classic covers which inspired them. The first single, a cover of Jimmy Cliff's "Harder They Come" is now available for streaming and download. The duo have also pulled together a backing band and will play a number of high profile U.K. shows including appearances at Camp Bestival this weekend and again at Bestival in September. I have nothing but great memories of Musical Youth and I distinctly remember being very excited to hear them played on American radio at exactly the same time that I was becoming totally obsessed with all things ska and reggae (Madness, The Police and UB40 were also getting some American radio play at the time which heartened me to no end). Though my family didn't have MTV, the video for 'Pass The Dutchie' (which was directed by Don Letts and became the first video by a Black musical act to appear on MTV) was bright and fun and it was hard not to like the band who despite their young age were actually playing their own instruments. While most everyone knows 'Pass the Dutchie' (even Homer Simpson referenced it in an episode of The Simpsons) few people have any idea what happened to the British-Jamaican kid group after their 1982 hit—or are aware that they were not just a pop novelty act but actual musicians who played all of their own instruments and wrote some of their own material (namely 'Youth Of Today' which is very catchy). Check out the interview Seaton and Grant gave recently about their experiences and read more about the band's 15 months of fame in the early 80's here. The band played a warm-up gig earlier this summer in Lewisham in the U.K., including their calling card as well as their version of Sugar Minott's "Good Thing Going" from their upcoming EP. Blue Riddim Band Release New Single From Forthcoming Album "Enter The Riddim"
Blue Riddim Band is readying the release of their latest album "Blue Riddim Band Meets Rougher All Stars: Enter The Riddim." The album is due out in September on Rougher Records and is a follow-up to their fantastic 2010 album "Tribute." The first single from the album "Do Me Like That" featuring Roy Sahyantis is out now and available for download on iTunes and from Rougher Records. According to Blur Riddim bassist Todd "Bebop" Burd: "We've talked with Roy for over ten years about collaborating, and then everything came together. He hails from Kingston, Jamaica, and lives part time here in Kansas City, MO. He contributed lyrics to the Black Uhuru album "Anthem", including the title track. It is also well known within the inner circles of reggae that Roy named the band, "Black Uhuru." Having worked primarily as a lyricist, Roy expressed a desire to finally sing his own song. We're excited about this track and have plans to record again with him in the future." 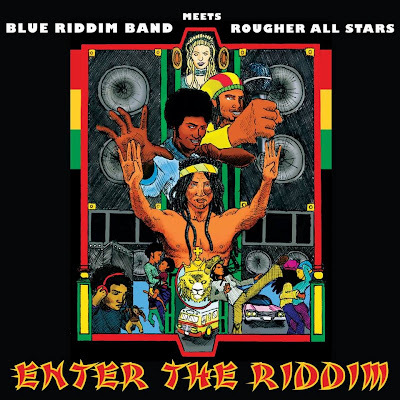 The new single and the album is a collaboration between Blue Riddim with the Rougher All Stars and features a variety of singers and players from all of the labels' projects as well as individuals the band have worked with over time. While reggae has become a global phenomenon, the idea of an American reggae band has often been hard for a lot of music fans to comprehend. However, very few groups have played reggae as convincingly as the Blue Riddim Band who hail from Kansas City. Drawing on influences from Coxson Dodd's Studio One label and Duke Reid's Treasure Isle label, Blue Riddim has flourished for four decades by mastering the rhythms that are the basis for all Jamaican music. While other non-Jamaican reggae bands have fallen into the trap of trying to reproduce the crossover sound of Bob Marley and The Wailers, Blue Riddim became students and later experts who could play a range of ska, rock steady, and rockers reggae like the originals that inspired them. At their height in the early 1980's, Blue Riddim had the distinction of being the very first American reggae band to be invited to play at Reggae Sunsplash. Their blazing set of ska and reggae covers and originals as dawn was rising over Jarrett Park on August 15, 1982 is legendary. They earned two encores from the crowd of 20,000 Jamaicans who were mesmerized by their 'blue eyed reggae.' Their Sunsplash performance was recorded for the LP 'Alive In Jamaica' released in 1984 which was later nominated for a Grammy for best reggae album in 1985 (see video below of the band performing 'Nancy Reagan'). Let that sink in for a minute. The band was nominated for a Grammy! Blue Riddim Band perform at Reggae Fest in Rock Island, IL on August 9th and at the Midwest Reggae Fest in Cleveland, OH on August 10th.